A government statement Monday said all six men, two of whom had refused food since July 19, were given political asylum. Given the imminent threat to the health and lives of Iranian asylum seekers continued hunger strike in front of the Office of the High Commissioner of UNHCR, the Ministry of Civil Protection has decided yesterday to activate the Appeal Board for the accumulated applications provided by Presidential Decree 81/2009, “on humanitarian grounds and very exceptional”, despite the government’s steadfast position that the current asylum procedure is impractical, ineffective and outdated. Only about four in 10,000 applicants are granted asylum, and a backlog of more than 45,000 appeals has built up. The Greek Ministry of Citizens Protection has drafted and sent the National Action Plan for Migration Management’ to the European Commission. The Action Plan sets out the complete strategy of the Greek government for managing migration, encompassing the screening of irregular migrants, the new Asylum system, detention, repatriation and returns. The strategy includes initiatives affecting vulnerable groups which have been made in partnership with the Ministry of Health. The Action Plan generally aims to ensure that the Migration challenges faced by Greece as a result of the large influx of irregular migrants are met with a fair and efficient system. The implementation of the Action Plan will take three years. The creation of a new independent Asylum service, independent of the police, and the complete restructuring of the Asylum system in Greece . The ultimate aim is to establish this new Asylum service which will be staffed by civilian personnel. This newly established Asylum Service is planned to take on its duties in October 2011. The Interim Presidential Decree setting out the transitional procedures for claiming asylum has already been signed by the Minister for Citizens Protection. The introduction of new procedures and support for vulnerable groups. This will be done by improving physical structures as well as increasing support to services working with vulnerable groups. Existing buildings used as receptions centers will be increased in space while alternative accommodation for these groups will also be sought. Financial and other support will be given to departments and organizations working with vulnerable groups, and a new body which will co-ordinate all social assistance which is given to these groups by the Ministry of Health and Social Solidarity. The role of the European Union and its member states in the implementation and oversight of this Action plan is crucial. Greece has the difficult role of guarding the external borders of the EU. Not only that constitutes a tremendous financial burden, but has also hurt its international image through criticism paid for maltreatment of irregular migrants. Greece is amongst the EU member states which are categorized in the Stockholm Program as countries facing ‘particular pressures’. As agreed, with the submission of the action plan to the European Commission, Greece is informing the EU of its goals and objectives and is anticipating EU solidarity in its attempt to manage fairly and effectively all immigration flows. Finally, the Action Plan highlights the important role of the EU in the assistance for signing readmission agreements with third countries and the need to fast track this process, as well as the necessity to revise the Dublin II Agreement. Hamid Saddeqi, a 36-year-old Iranian refugee, has entered the second month of a hunger strike protest outside the offices of the United Nations High Commissioner for Refugees in Athens. He has sewn his lips shut and is refusing food to highlight the fact that he is still waiting for his application for political asylum to be processed after his papers were first submitted 8 years ago. Since the protest began, the hunger strikers have suffered harassment and arrest at the hands of the Greek police. But that has not stopped the number of hunger strikers and supporters protesting outside the UNHCR offices swelling to twenty and all are in the same boat, victims of the fact that Greece only grants 0.04% of all asylum applications it receives each year. the people who put this information on a blog are liars”. We visited 16 places in Evros, mainly detention prisons but also hospitals, to try to find out. The step to the funeral of Sidiro was the last of this travel…. We went to the cemetery, knowing that it is one of the rare cases that refugees who die on the borders of Greece and Turkey are buried in respect and among people of their religion. We wanted to see this place and take also pictures, for the worst case that the DNA test proves that the three men have been also burried anonymously there. So that the wifes and children know at least where their fathers are buried…. We were shocked of what we found out, returned to the village Sidiro to talk to the Mufti, who then had disappeared and didn’t go on his phone for the next day, and decided then to make the story public. the buried bodies are for sure still there. This people died trying to enter Europe, fleeing from the situation in their countries. They died because they could not go like you and us with a passport in the hand through the borders, they died because Europe doesn’t want them. 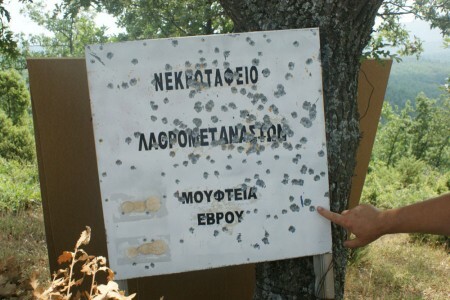 The war that is going on in the region of Evros, with the military machinery of greek police and frontex the european border police, has victims. And it is your responsibility that the vicitims are respected at least after they are dead. Some unrespectful people shoot at the cemetery sign with guns, you shoot at them, for a third time. The memory of Bashir-Hahdi-Mohamad and all others who left their hopes and life on the greek borders is for us a reason to continue searching for the truth. We know, of course, that a daily war is going on across the border of Evros, and its victims [we talk about dead people] are always the refugees. But it’s even shocking to know that the dead refugees are dumped into pits in the fields. Contextually are coming to mind images in black and white of war and mass killings, pictures of holocaust, with bulldozers piled up in ditches piles of corpses. Is this an exaggeration? But yet … The proportions that make the association inevitable is tolerance, indifference and complicity of those societies which are responsible for massacre. Exaggeration? What the hell… Let’s we all learn to listen and then everyone should take responsibility for the tolerance, the indifference, and the complicity. Each year hundreds or thousands of people are killed around the -so called “civilized” western world- Europe ‘s external and internal (sea ports, detention camps) borders. The mass slaughter is taking place at our next door, as corpses are washed up on beaches where the western tourists are having their holiday, on beaches where the greek fishermen are fishing. Tragically, this mass slaughter on the borders is only the last act of the drama for the refugees who escaped from countries that have been devastated by western colonization, the IMF, dictatorships and tyrannies – servile to western interests. From countries which lack rudimentary infrastructure for the reasons above, and on the first heavy rainstorm or on a usual earthquake are measuring carnage victims. From the countries ravaged by wars for oil, diamonds, by wars of the western capital, by wars with the participation of the greek state for the sake of the greek capital. After all these, at least let us demand from this state to bury the people who were killed in its frond door – bury them like humans and not like dogs. As a society we also have to demand stopping the institutional reproduction of this humiliating designation “illegal” for those people who were lucky enough to survive and cross that door. During the first seven months of the year 2010, 38 human beings died while attempting to cross the heavily guarded Turkish-Greek border. The corpses of the dead are being transferred to the department of forensic medicine of the university clinic of Alexandroupoulis. Since they can often not be identified, only a DNA-test is being carried out so that relatives can still gain certainty. On 25th of June 2010 19 people drowned in the river Evros/Meriç. 14 corpses washed ashore on the Greek side and were brought to the university clinic by an undertaker from Orestiada. After the dead had been examined and registered, the undertaker brought them to a village of the Turkish minority on the mountains above Souflí for them to be buried on muslim cemetery. However, the corpses can now be found in a mass grave outside the village of Sideró, in inaccessible terrain. Only a sign, riddled by many gun-shots, tells that this is the cemetery of the illegal immigrants where the corpses are buried. It is not immediately obvious that it is a mass grave. Upon closer inspection, one can however see holes that were excavated and again filled up by bulldozers and that can contain up to ten corpses. Further investigation by w2eu, currently in the area to look for the corps of the father of a family who died in the incident on the 25th of June and whose family is currently in relative security shows that this practice has been ongoing for years. It is believed that between 150 and 200 dead have been buried in the mass grave. Although the local government ordered an ablution and burial according to muslim rite, the dead have merely been buried in the mass grave. This practice fundamentally lacks any respect for the dead as well as their relatives. Even an exhumation for the dead to be buried in a more dignified way is not possible anymore. The existence of this mass grave at the external border of the EU fits the image of constant and continued humiliation and degradation of refugees. It is with a systematic brutality that refugees and migrants are stopped from crossing the borders, a brutality that even puts up with the death of those looking for protection. Even after their death, those human beings remain second class people that seemingly not even deserve a burial of human dignity. We protest the abominable treatment of refugees and migrants and the contempt that is shown to them, no matter if dead or alive. Citizens’ Protection Minister Michalis Chrysochoidis and Ilkka Laitinen, the executive director of Frontex, the European Union agency for external border security, signed an agreement to set up an operational office in Piraeus for Frontex. The official opening of the operational office is scheduled for October 1st, 2010. The Greek authorities should immediately review their policy of locking up irregular migrants and asylum-seekers, including many unaccompanied children , Amnesty International said in a new report today. Greece: Irregular migrants and asylum-seekers routinely detained in substandard conditions, documents their treatment, many of whom are held in poor conditions in borderguard stations and immigration detention centres with no or limited access to legal, social and medical aid. “Asylum-seekers and irregular migrants are not criminals. Yet, the Greek authorities treat them as such disregarding their rights under international law. Currently, migrants are detained as a matter of course, without regard whether such measure is necessary. Detention of asylum-seekers and migrants on the grounds of their irregular status should always be a measure of last resort,” said Nicola Duckworth, Europe and Central Asia Programme Director. Detention prior to deportation can last for up to six months in Greece for asylum-seekers and irregular migrants . Greek law also makes irregular entry into and exit out of the country a criminal offence. Tens of thousands of irregular migrants and asylum-seekers arrive in Greece each year. The vast majority of asylum-seekers and individuals fleeing war-torn countries reach the country through the Greek-Turkish land and sea borders. They are mostly Afghan, Somali, Palestinian, Iraqi and Eritrean. “After an often hazardous journey, migrants end up in detention centres without access to a lawyer, interpreters or social workers. As a result, their circumstances are not assessed correctly and many in need of international protection may be sent back to the places they have fled, while others may be deprived of appropriate care and support,” Nicola Duckworth said. Irregular migrants and asylum-seekers are not informed about the length of their detention or about their future. They can be kept for long periods of time in overcrowded facilities with unaccompanied minors being detained among the adults. Those detained have limited access to medical assistance and hygiene products. Few asylum-seekers are recognized as refugees by the Greek authorities. From the over 30,000 asylum applications examined in 2009, only 36 were granted refugee protection status while 128 were granted subsidiary protection status. In the vast majority of detention facilities visited by Amnesty International delegates, conditions ranged from inadequate to very poor. Those detained told Amnesty International of instances of ill-treatment by coastguards and police. Length and poor conditions of detention provoked irregular migrants and asylum-seekers to stage protests in Venna, north-east Greece in February 2010. Likewise, in April 2010, irregular migrants went on hunger strike on the island of Samos to protest their length of detention. “Detention cannot be used as a tool to control migration. The onus is on the authorities to demonstrate in each individual case that such detention is necessary and proportionate to the objective to be achieved and that alternatives will not be effective,” Nicola Duckworth said. Amnesty International believes the plans being developed by the Greek authorities to establish screening centres, should include alternative approaches, such as those running open or semi-open centres for those arriving in the country. The authorities need to ensure that irregular migrants and asylum-seekers arriving at those centres have access to free legal assistance and interpreters in languages they understand, and medical assistance. The Greek authorities should undertake a comprehensive overhaul of the legislative framework, policies and practices regarding the detention of irregular migrants and asylum-seekers, including in particular the treatment of unaccompanied children. These are the key conclusions in this report which shows that currently, immigration related detention in Greece is used without regard to its necessity or proportionality, and not as a measure of last resort.